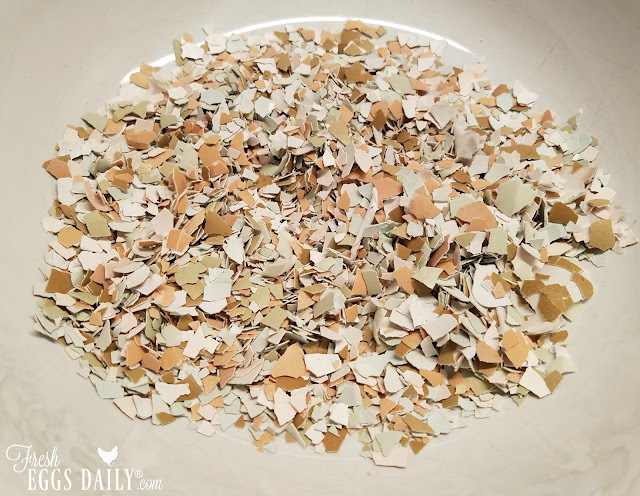 Even chickens fed the best-quality layer feed will benefit from being offered a calcium supplement to ensure strong shells on the eggs they lay. 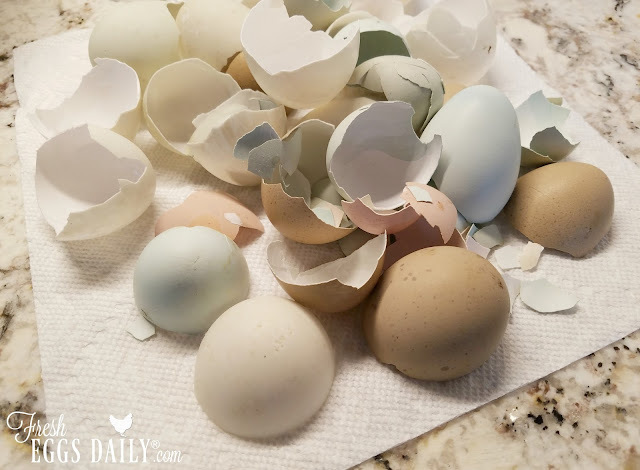 Crushing eggshells and feeding them back to your chickens is the easiest, most economical way to give your girls some extra calcium. The process is simple and easy, but there are a few myths and misconceptions out there. So first here are a few clarifications - and then I'll share my simple method. - Myth: Feeding your chickens crushed eggshells will lead to "unauthorized" egg eating I actually think that by feeding your chickens eggshells it helps prevent egg eating by providing them extra calcium, so they don't go looking for it on their own. - Myth: The shells need to be baked or microwaved There's nothing on them that your chickens haven't already been exposed to....I just let them air dry. However, if you feed your chickens shells from store bought eggs (which I don't really recommend anyway - see below), they should be baked to kill any bacteria. - Myth: The shells should be pulverized The shells should be left in fairly good-sized pieces. Realistically, your chickens will break larger pieces up, but so the shells don't resemble eggs, crush them to 1/4" sized or so. Pieces smaller than that will pass through your chickens' systems too fast and not be absorbed. 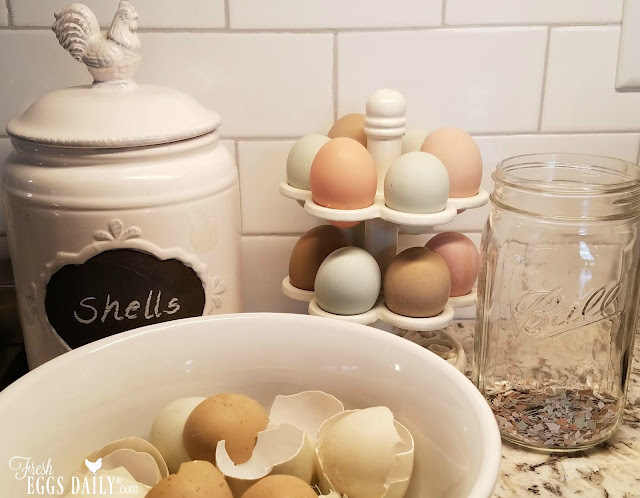 - Myth: It's okay to feed your chickens shells from store bought eggs or a friend or neighbor's chickens Those shells might contain bacteria that your chickens' systems aren't used to and could make them sick, so I don't recommend it. - Myth: Eggshell should be mixed right into your chickens' feed. Shell should always be fed free-choice so each chicken will eat as much or as little as she needs (and roosters and not-yet-laying pullets) won't eat any. If you mix the shells into their feed, you're just going to find that you end up going through way more than is necessary. 1. 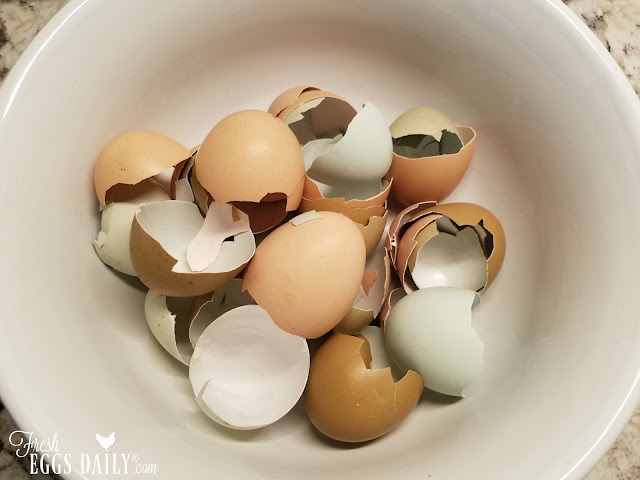 After cracking my eggs into the bowl or frying pan, I toss the empty shells into the sink. 3. Then I let the shells dry on the counter on a paper towel. 4. 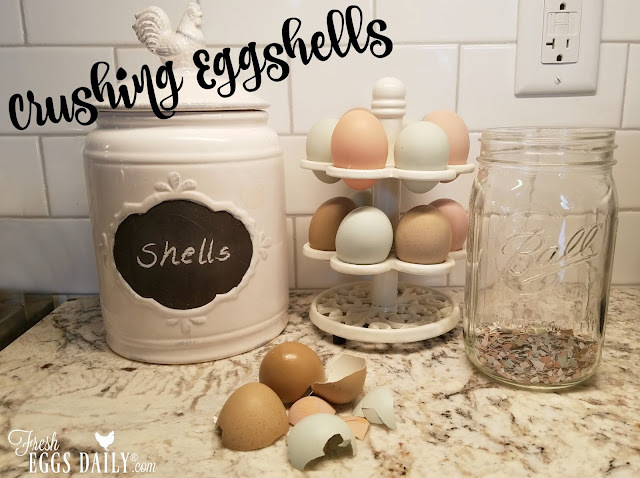 Once the water has dried off the shells, they go into a bowl on the kitchen counter for a few days until they're brittle. 5. 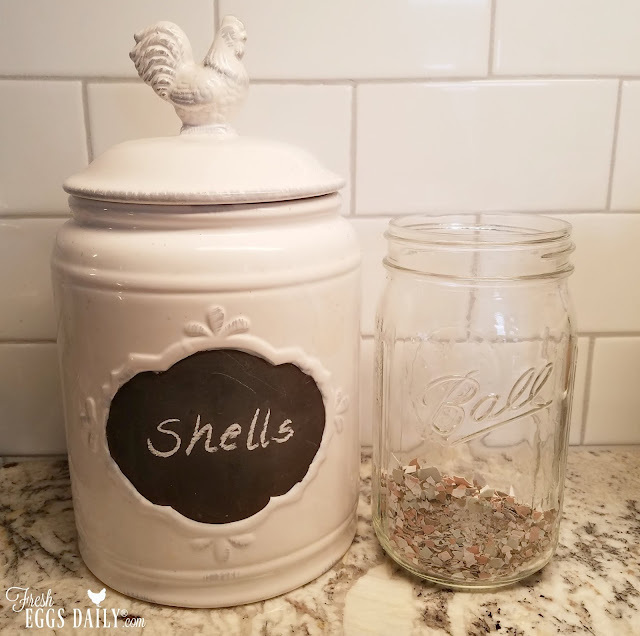 Once the shells are dry and brittle, I simply crush them with my fingers into fairly small pieces and then store them in a canister or mason jar. When the dispenser in the coop is empty, I refill it from my stash in the kitchen. And it's as easy as that. No baking, nuking, rolling pin or coffee grinder needed. And you've got a simple, free and easy source of additional calcium for your chickens!